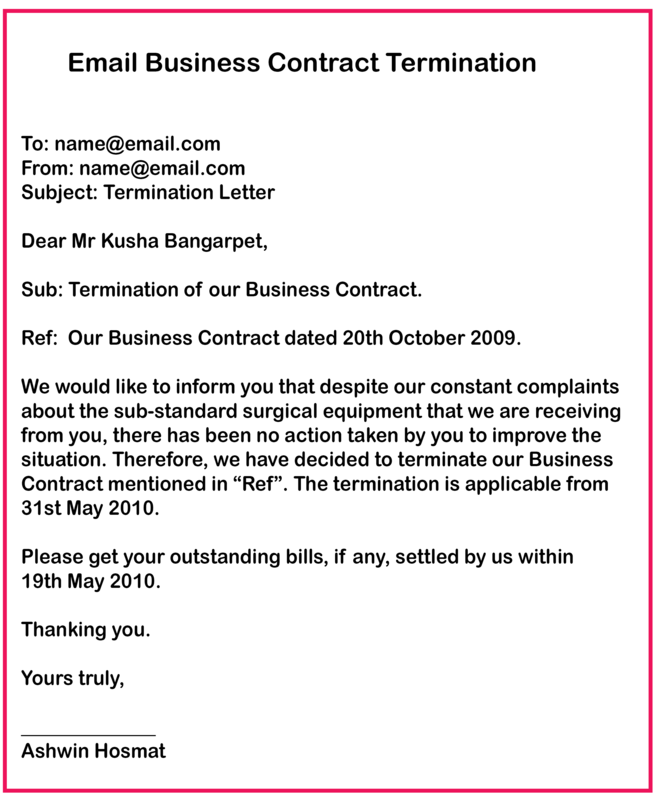 Business Contract Termination Letter is an agreement signed between two or more parties stating to revoke the contract amongst them. Agreements and Contracts play a vital role in the business world. They define the relationship between two or more parties involved in a business deal and is therefore important to be signed by the parties involved. But what to do when the companies or individuals that were involved want to terminate the deal? The contract still stands. But with the mutual termination agreement, the contract could be terminated. For that, the party that requires the termination must send notice prior to the expiration or termination date to the other parties involved. It has fulfilled its purpose. The said agreement could be voided only when the party seeking the termination will give notice prior to the termination, and only when the agreement is reasonable and lawful. 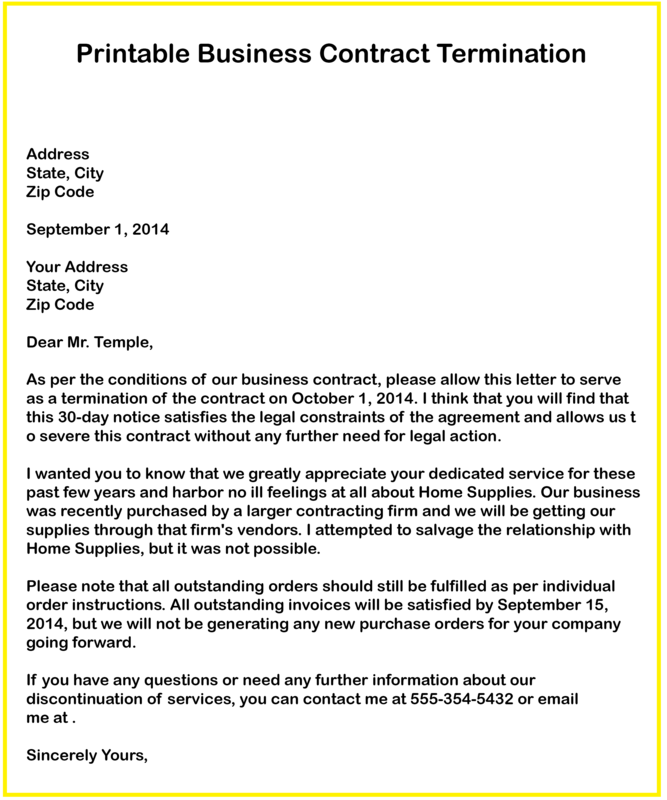 Those who look after this sort of dealings must be able to write a superb business letter. If you are someone who has to write a letter of such sort, you can take help from the letter samples provided, pertaining to the how-tos and the overall format of the letter. When you are writing any sort of business letter, be it a simple resignation letter, or a thank you letter to your boss or a business deal letter like the one we are learning here, it must be taken into consideration that even though you might know the person personally, the tone of the letter must always display your professionalism. The reason for terminating the deal should be lawful, state the facts, and explain how the outstanding items will be handled in the future. The letter templates that have been provided are meant to help you in drafting a better and pretty straightforward business letter that will make an impact on your business partners. They contain the key elements that help to avoid any misunderstandings and the termination of the partnership can be done on amicable terms. As mentioned above, the Grounds For Termination Of Contract must be reasonable and lawful. That is why the letter must take into account the type and nature of the business agreement. As the business contracts could be for various purposes, to terminate them could have various reasons. The letter could be written as just a formality to inform the other parties involved that the contract period has completed and the services will be terminated from further on. It is a simple business courtesy to mention such information in writing. It could be sent from one party to another to inform them about the scope and covered period. As parties involved in the agreement, the must observe the terms and conditions and perform likewise. For documentation purposes. This is the best of the purposes. Why? Because this is the most valid reason to write a letter. To provide any misunderstandings or conflicts between the parties involved, the document will be held as a piece of evidence. 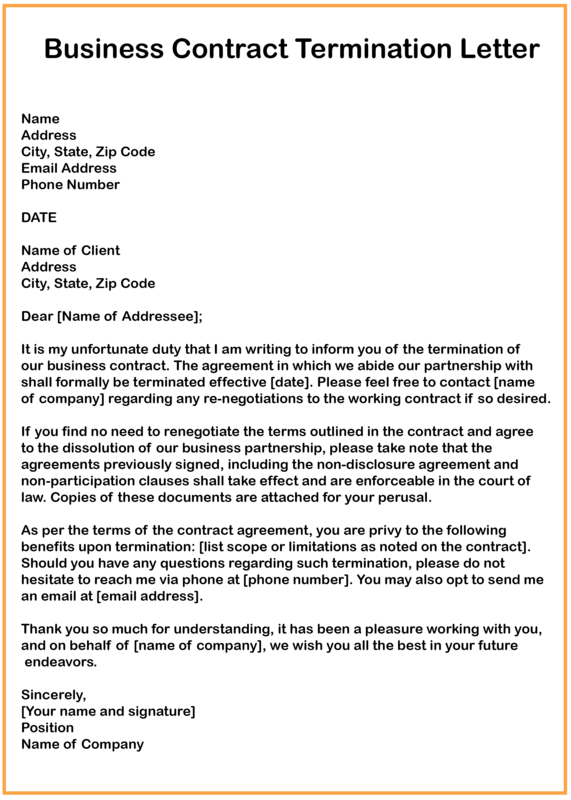 It is true that the usefulness of a business termination letter cannot be understated. they help promote healthy business terms and avoid conflicts beyond the contract terms. A business contract, as mentioned above, is a really important document that gets signed by the parties involved in a business deal. This contract can be made due to legal reasons or for documentation purposes. 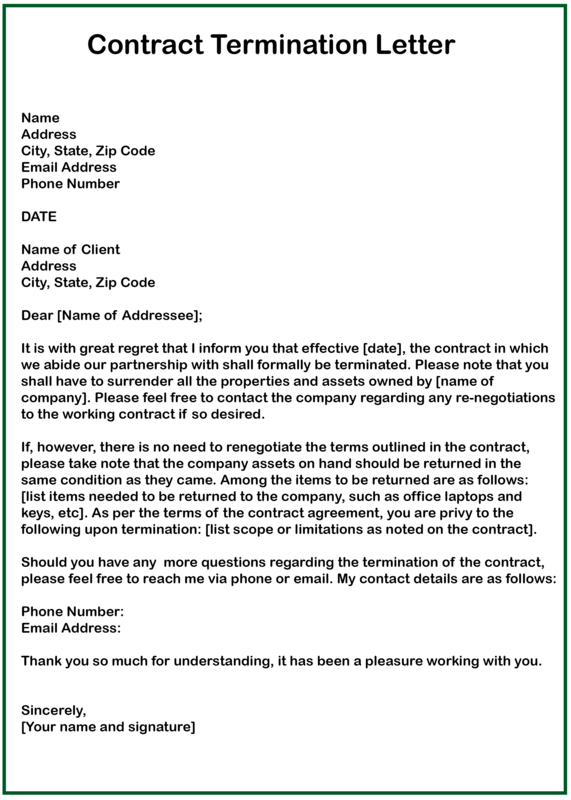 Similar to this, when we want to end the contract, we need to write a letter or notice in order to inform the other parties that the contract has to be ended or it has expired. Usually, this letter is written for documentation purposes, so that any miscommunication and fraud could be avoided in the future. Letterhead of the company. 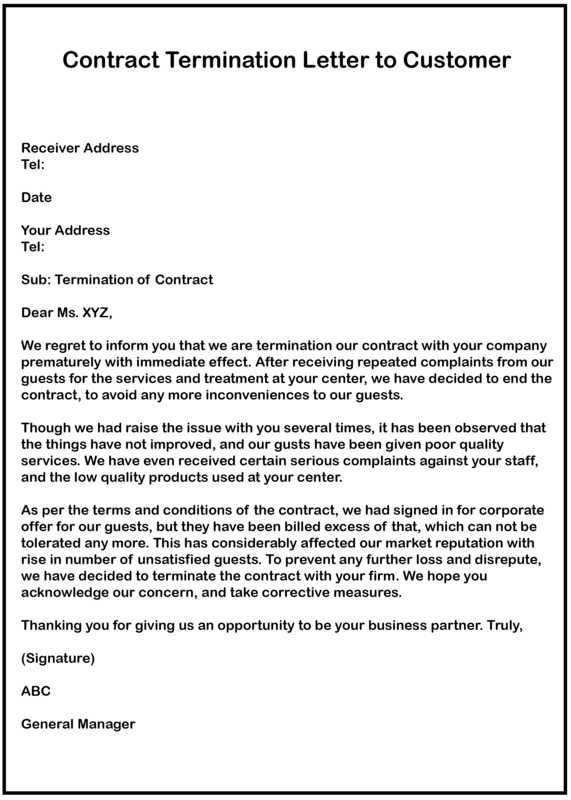 Since it is an official letter, it should be printed on the letterhead of the company. This will ensure that the letter means business. This is will also include the basic contact details of the company, plus the company logo. Must include a clear and straightforward reason for the termination. Cite the grounds in a clear manner. Even if it is because of an unfavorable financial crisis. 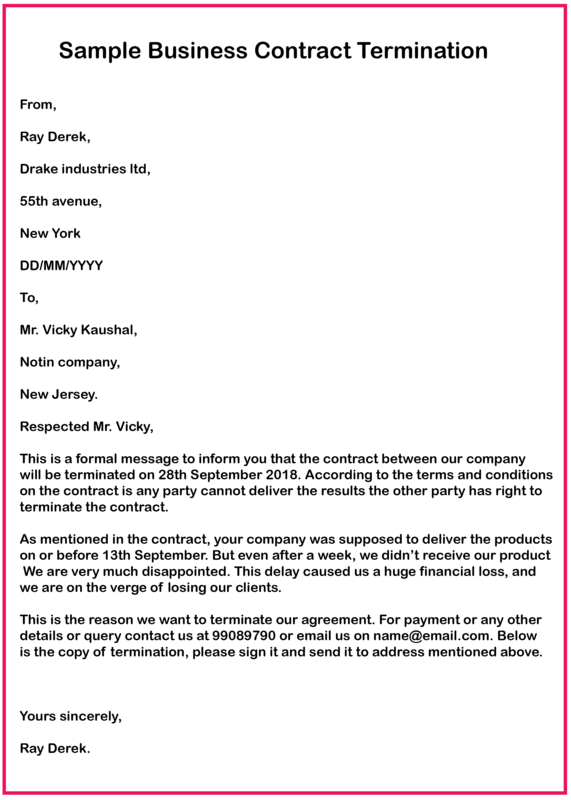 You must also share the date from which the termination is going to be affected. Emphasize on your reasons and cite specific provisions of the contract to prove them. Conclude your letter. In the end, wrap up your letter, extend your final thoughts and message to the addressee. Give a positive ending to the letter and appreciate them for their work and support. You can also include your personal contact details if required so that the addressee has further inquiries. Signature of everyone involved. Make sure that the letter is duly dated and signed. Do not delay this part as in future if there comes the need of using this document in legal work, you might have to face some difficulties. Keep some extra copies of this letter in case the original gets lost or just for reference. 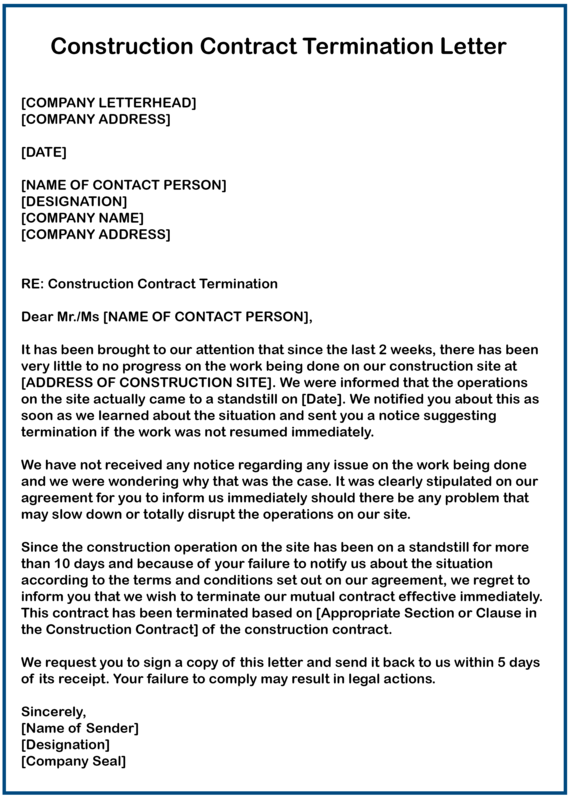 Do share with us your experience with our business contract termination templates, and don’t forget to share! !